It’s a day to be thankful for all of the gifts that I receive. For years I’ve been creating a wildlife habitat in my urban garden by providing water, food and shelter. As they say, birds of feather flock together and it is true. The more birds see other birds the more come in as they feel it is a bird-friendly place. This year has been particularly unique as I’ve had quite a few rare visitors in the garden. Reward for all of the patience, time and effort. At least five years ago I carefully selected a nesting box for a screech owl and read up about what height to place it, which way to face it, type of tree on so on. So I placed the box and waited. And waited. And waited. Nothing and I mean nothing moved into the box. Not a bird, not a squirrel, not a raccoon and especially not an owl. It didn’t stop me from looking at the box each day that I went in and out of the house hoping to see a head pop up. Earlier this week I saw something there. My first thought is that the squirrels finally decided to take up residence as one of their favorite trees had been taken down earlier in the year. But then I thought..well…maybe. So I got my binoculars and peered through the glass. OH MY STARS !! It’s an owl !! A Screech owl – gray morph. Couldn’t believe my lucky stars. Of course I had to run into the house dancing a jig announcing the big news. And here’s where the hoping comes in. Was it a one-time event or did s/he move in for the wintertime. The next time I waited until owl time which is usually just before sunset around 4:30pm. And sure enough, we’ve got an owl in the box! Using my Canon 1DX ii with the 500mm f/4 set on a tripod I knew there was no light. The image above is at ISO 6400, f/4.0 at 1/30 of a second. Granted the owl is not moving so why not? A bird image at 1/30th of a second say it isn’t so. I then brought the image into AI Clear, a noise reduction and detail extractor module in Topaz Studio and cleaned up the image fairly nicely. Tomorrow I share some more of the rare feathered friends beauties that I’ve had this year. May you have a wonderful Thanksgiving Day and count your blessings small and large. UPDATE ! I heard from the designer and maker of this wonderful squirrel resistant box and he is a fellow blogger as well. 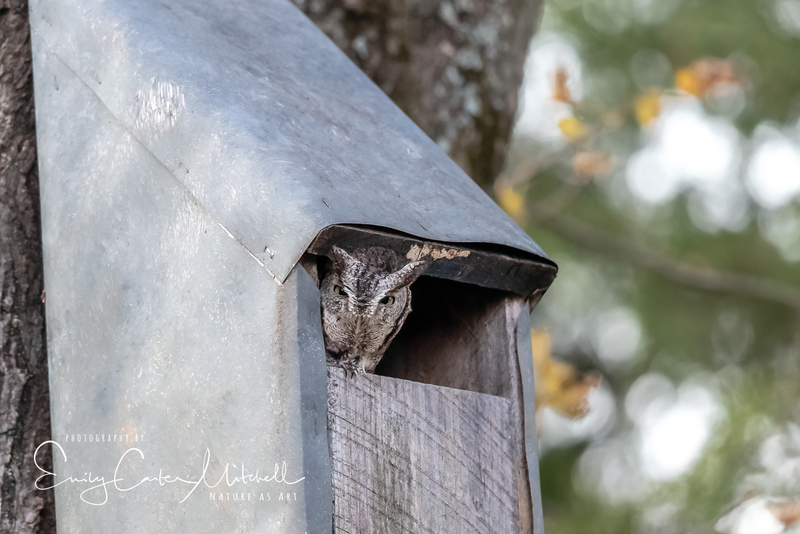 If you’re interested in adding a Screech Owl Box to your garden, please visit and Scott will be more than happy to answer any questions you may have. Thank you so much and for being a great blogger friend. Thank you Pit. You’re most welcome. And thank you for all the photo/camera details. That helps me to learn. Congrats on the owl resident very exciting! Thrilled you found this post and thank you so much for such an awesome box. I’ve shared the word and updated this post with your blog. What a perfect Thanksgiving gift – Happy Thanksgiving! Best ever Joanne. Thank you and enjoy the day! Fantastic. I love when a plan works….finally. I’m adding an owl house to the yard! As you should Willy ! Thank you and I sent you information on this box. So glad that it decided to stay around. Congratulations! Such a joy to get to witness. Looking forward to future owl posts. Happy Thanksgiving! I’ll do my best to leave it to his/her own as surely they’re shy. If anything it shows up late in the day when there is no light. Thank you and enjoy the weekend Shannon. One of our resident owl pair is using our box periodically for a day roost while the other roosts in our neighbor’s palm tree. We use our ‘owl time’ each evening to split a beer and sit to watch for owl flight, as well as moon rise, leaf drop, possum prowl–whatever is on tap each night. It is a lovely way to be aware of your own surroundings, isn’t it? That is so adorable! Lucky you that you have two of them. Bonus!